In my teenage years I collected Elfquest, and Grendel, and suffered with all my friends when issue 121 of the X-Men mysteriously failed to arrive in Britain in that dark, dark month just before my O-Grades. When I was a student I worked on Saturdays at Aberdeen’s science fiction bookshop, and read the week’s new comics when the owner went to the football in the afternoon. I grew up on US comics and cosy recycled DC Thomson strips from the 1950s, but with 2000 AD the doors were flung open to gritty futuristic and alternative realities in British and US clear line style. I enjoyed Viz until the Fat Slags just got too vile to bear reading. Discovering Love and Rockets was stupendous: I found the collected edition in Escape, that excellent little comic shop that used to be opposite the British Museum, and lugged it home on the Eurostar, worrying the too-cool Frenchman sitting next to me. Non, mais vous lisez quoi? Now, British comicdom, I’m back. Titan Comics have got me now. Ben Aaronovitch has written the first in an intra-book comic series called Rivers of London, part of his Peter Grant stories about that branch of the Metropolitan police that deals with magic. It’s British, it’s a proper London comic and it is wonderful. How can any story fail to entrance when the first four (living) characters are a river goddess in a purple wetsuit; DC Guleed in a hijab, her boss DI Stephanopoulos, a butch lesbian in a seriously good-looking frock coat; and the chap we’ve all been waiting for, DC Peter Grant (in a plain black suit). He’s a junior police officer from the Folly, the unit that does the ‘weird stuff’ for the Force, which means he does magic. 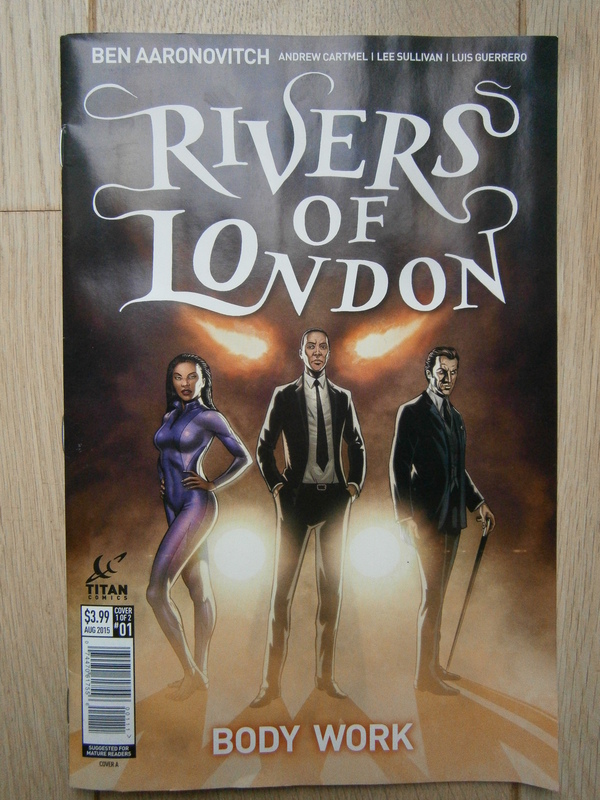 Rivers of London is co-written by Andrew Cartmel, beautifully drawn by Lee Sullivan, and finished by Luis Guerrero and Rona Simpson. To get up to speed on the story, read my review of the first five books of Aaronovitch’s Peter Grant series here, and come back when you’re ready. So, ‘Body Work’ is a very short episode placed somewhere in between books two and three. Peter turns up unexpectedly just as a crashed BMW is being winched out of the Thames because he’s been forewarned by Beverley, the goddess who found it. He can sense vestigium – the trace of magic – on the car, so Stephanopoulos sends him to interview the driver’s ex-girlfriend, with Guleed to keep him in order. Dealing with magic as a routine thing, and learning to be a practitioner makes a detective constable liable to take unorthodox ways round a problem, which the Met do not appreciate. Ever since Peter hijacked an ambulance to get a river god back to the Thames before he died from loss of blood, he’s been a byword for over-reacting. When his best mate Lesley, a far better police officer, had a ghastly encounter with a shapeshifter in book 1, also called Rivers of London, other officers are less willing than they should be to work with Peter. The strongest element of the storytelling in ‘Body Work’ is the showing, not the telling. The interview with the ex in the police station is drawn with the faces aligned to show flip-book reactions. Aaronovitch’s trademark inversion of casual racism works in the books with Peter’s narrative voice noting that, for instance, ‘a white girl came out’, or ‘the bus was driven by a white guy’. 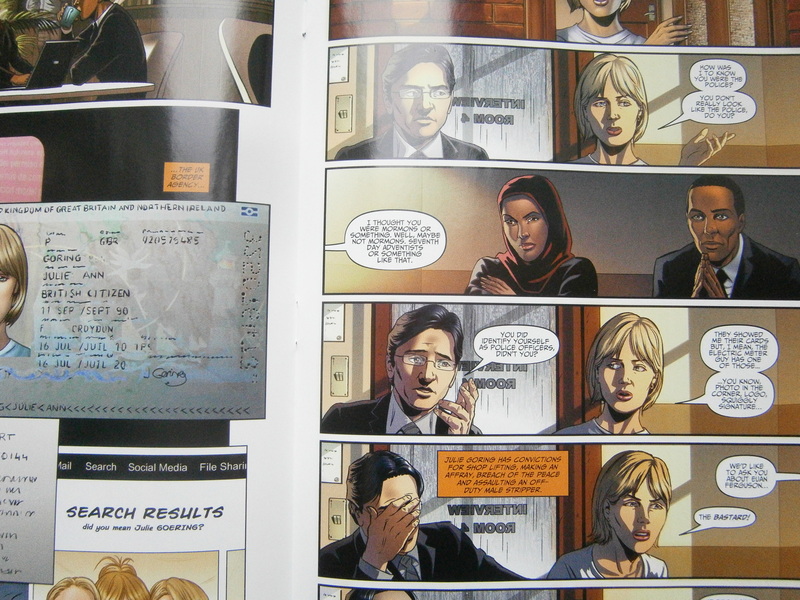 In the comic, in a superb and biting moment, the ex-girlfriend of the dead man doesn’t realise Sahra and Peter are the police because, as she says, they don’t look like police, do they? Cue the next panel, with a gritted-teeth woman in a hijab and a black guy, both in suits, both so clearly figures of authority, silently asking ‘what the hell do we look then?’ They’re silent, because this is what it’s like running into everyday racism in Britain. One of the strengths of Aaronovitch’s writing is that he underpins the fabulously complex police procedural plots with really detailed vignettes of London life as it is not lived by, for example, the London literati, the Members of Parliament and the people on the telly. ‘Refreshing’ doesn’t even begin to convey the relief of reading stories by a writer who doesn’t work on those power circuits. Gawd bless ya, Mr Aaronovitch, for writing Britain like it is and ought to be. And there are extras! Two two-page chats from Peter about classic BMW cars, and Putney (why Putney …? ), and, best of all, a one-page story about Beverley Brook, the river goddess who introduced Peter to a whole new kind of skinny dipping in Foxglove Summer. The next issue of Rivers of London is out in August: don’t miss it. Yes, I only found out because I Follow him on Twitter. Bought it in Forbidden Planet.